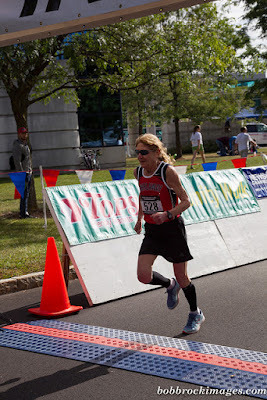 The Running Professor: Age Division Contests [60 and up] at the USATF Masters 5K Championships in Syracuse-Competition Still Like Crazy After All These Years!! 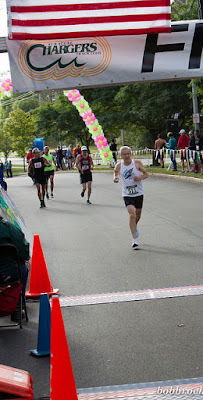 Age Division Contests [60 and up] at the USATF Masters 5K Championships in Syracuse-Competition Still Like Crazy After All These Years!! October 12 2017. It is time to cover the Seniors and the Vets, as we are sometimes called in the road racing world. If you think races become less competitive with age, give that some more thought after this recap. And by the way, several of the more competitive racers were not able to make it. Libby James, who set a new American record in the 80-84 division last year did not make the trip from Fort Collins, Colorado this year. But we got Jan Holmquist back from injury this year in exchange, to take on the fastest 70-74 year olds. On the Men's side we were missing Brian Pilcher who broke the American 60-64 record last year. He hoped to start his comeback tour with Dave Oja's last race but the hamstring would not cooperate. Peter Mullin who has been on the 65-69 podium in every race he has competed in this year, came to the race but felt a slight twinge in the hamstring while warming up and decided it was the better strategy to refrain and race again another day. I hope to see him, and a few others, in Tulsa for the 15K! 60-64. Brian Pilcher let me know a couple of weeks before the race that he was entered but would only be in shape to run around 17:20. He ran 16:38 last year. He was a favorite for the podium. With him out, the rest of the field still had plenty of competition to worry about. 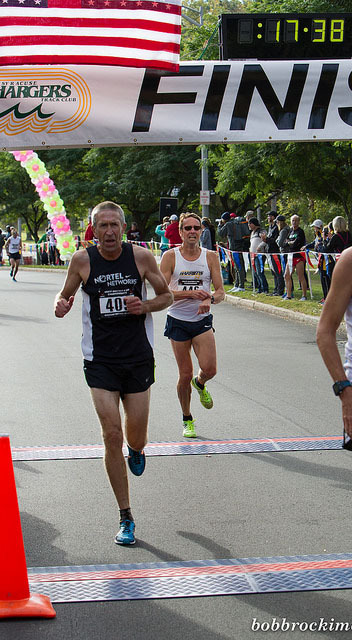 I had Tom Dever based on his recent win at the Masters Road Mile Championship. In 2015 he competed in 3 championship events, running 28:44 in the 8K at Brea, 1:17:07 in the HM at San Diego, and 43:38 in the 12K at Alexandria. I understand he had some surgery scheduled. Then he was away from the circuit until Flint this year. At age 60 Dever would be ready to roar! Ken Youngers was another runner who had been away from the circuit, taking car of overdue or at least postponed surgery. Like Dever he returned ot action at Flint and ran just a little slower than Dever. When I saw that Youngers had run a 17:07 5K a week after Flint, I almost reversed the order, thinking that perhaps Youngers had better prep for a 5K than Dever. Others I identified as having a shot included the 2nd and 3rd finishers from last year, Tom Ryan and Kyle Hubbart, who finished within a few seconds of one another. Hubbart has better race times this year than Ryan so I thought he had the better chance of breaking onto the podium.I mentioned Charlie Andrews as having an outside shot on the podium based on his 17:31 here last year when he was 59. I should have given that time more weight than I did. Had Pilcher shown up ready to run a 17:20, he might well have found himself running stride for stride over the first half of the race with Dever and Andrews. They opened up a 7 second gap on Youngers thanks to a 8:35 halfway mark, on pace for a 17:10 5K. Ryan, consistent with my doubts, was 5 seconds off the pace, but to my surprise Hubbart was 20 seconds behind Ryan, concentrating on running his own race. Past podium finisher, Reno Stirrat, was running with Hubbart through the turn. Hubbart was the only one of the leaders who ran close to an even pace. Dever, Andrews and Youngers all ran from 21 to 34 seconds slower over the final 2.5K. But the only thing that changed about the order was that Andrews surged around and away from Dever on the way to an 8 second victory. Youngers cut 5 seconds out of Devers lead but that was not enough to catch him. Ryan finished in 4th, 16 seconds behind Youngers. Hubbart's steady pace took 7 seconds out of Ryn's lead but Hubbart had to settle for 5th. Stirrat, who has struggled with injury and health issues over the last year, was not able to hang with Hubbart, but finished strong for his Shore AC team nonetheless. I had Nora Cary and Patrice Combs battling for the win, with Cary having a slight edge. Last year Cary ran 6 seconds faster than Combs who was still in the 55-59 division. Based on their performances earlier this year at Virginia Beach in the 8K and in a number of championships over the last couple of years, I had the Impalas, Mo Bartley and Jill Miller-Robinett, pushing each other for the bronze medal. Combs,'s Atlanta teammates, Margaret Taylor and Cynthia Williams, could also factor in, but would need something special to break onto the podium.Cary and combs moved out smartly when the gun went off and found themselves running stride for stride as they put over a half minute worth of distance between themselves and the 2 Impalas. Bartley and Miller-Robinett had over a half minute on the rest of the field and, in particular, Williams and Taylor, who were being challenged by Coloradan Tracey Bernett. Cary had 2 seconds on Combs at the turn, and that's the way it stayed until Cary was able to pull away and take first by six seconds over Combs. It was a hard-fought battle and in one of life's ironies, the gap between them at the finish was the same as in 2016, to the second! Bartley had 13 seconds on her teammate at the halfway mark and stretched it to 16 by the finish line. Miler-Robinett had 4th with almost a minute advantage over Bernett, with Williams and Taylor following in 6th and 7th. 65-69. When there are two record setters in the field, like Sabra Harvey and Edie Stevenson, it does limit the podium aspirations of the rest of the field. 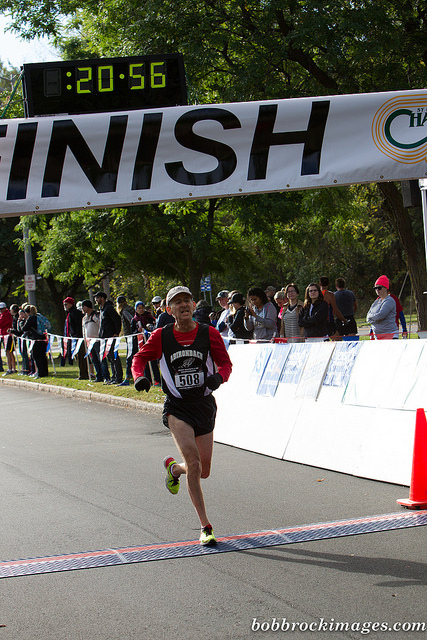 Harvey broke the American 5K record for the age Division at this race in 2015 and earlier this year ran faster than the American Record for the 10K at Dedham. 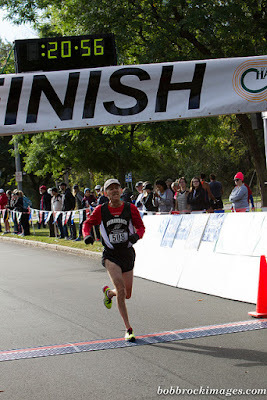 At least Stevenson's record efforts have mostly been at longer races like the Cherry Blossom 10 Miler. Still that does not mean she is slow at 5k, not by any means. Coreen Steinbach, Nonie Hudnall and Jo Anne Rowland finished within 27 seconds of each other in 3rd through 5th. Steinbach had comparable times this summer so she was the favorite for the bronze medal. Hudnall's times this summer appeared slower than last year and Rowland missed considerable action in the spring to lower back issues. Cindy Ingalls missed most of 2016 but seemed to be making progress in the spring. But with no races in the summer, it was hard to project her as a podium contender yet..
With little competition from her peers, Harvey went out fast with runners anywhere from 10 to 40 years younger, crossing the halfway mat in 10:19. Twenty seconds later Stevenson came speeding by, with her closest pursuer, Coreen Steinbach, half a minute back. Unlike last year Steinbach had nearly half a minute on Rowland. Hudnall was another 13 seconds back, with Ingalls trailing her. And that is the order they finished in. Harvey and Stevenson ran their usual well-paced races, finishing in first and second in 20:44 and 21:34 respectively. A minute and a half later, Steinbach had defended her 2016 bronze medal. Rowland had taken four seconds out of Steinbach's lead but could not get as close as last year, finishing almost half a minute back. Hudnall and Ingalls took 5th and 6th. In previewing the Men's race, I referenced the fact that the finishing order at Championships this year has tended to be: Tom Bernhard, Peter Mullin, Doug Bell, and Kirk Larson, and there appeared to be no reason to expect otherwise. Although I did allow for the possibility that Chuck Smead, the Cross Country ace who runs with the Boulder Road Runners, could make the podium. (I learned later that Smead could not make the race after all) .But Mullin ran into trouble with a hamstring twinge and he decided to be sensible and not run. That opened things up a bit. 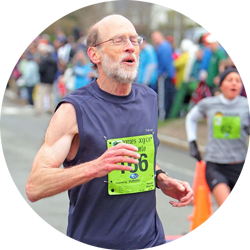 Local runner, James Foster, had a 3:39 Marathon and a 1:12:35 10 Miler; neither inspired confidence that he could crack 20 in a 5K. But the marathon was Boston, which was hot, with slow times this year, and the 10 Miler was subtitled the 'Mountain Goat' 10 Miler. Maybe he had a chance after all? 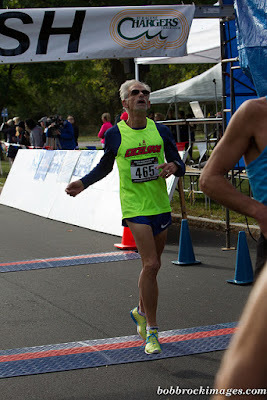 Another dark horse was Bob Giambalvo who had finished only 4 seconds behind Larson in 2016 but ran a 29:55 4 miler in March and had no results since. That sounded like an injury problem. Last year Bernhard had gone out way too fast and nearly sabotaged his record attempt, running 17:31 when he felt he was in shape to run well under 17:30. This year his fitness would not allow him to try for a sub-17:30; Bernhard's early pace was sensible as he hit the halfway mark in 8:48. Despite his best efforts to stay with Bernhard, Bell found himself 12 seconds back at the turn. But that gave him over a 30 second gap back to the closest pursuers, Larson and Foster, locked in stride, only 1 second apart. Giambalvo was 20 seconds back, but that was pretty good considering where he was in March. Bernhard and Bell cruised in taking first and second in 17:57 and 18:49. Bernhard defended his 2016 championship and took his 4th Age Division gold medal in 4 tries this year; Bell had a silver medal to add to his 3 bronzes this year. Both are having great years. Foster channeled his inner 'mountain goat' over the second half, found another gear and pulled away from Larson to take the bronze medal by 8 seconds. Giambalvo came in 20 seconds later, happy to break 20 minutes again. 70-74. Gary Patton, who won last year, was not entered. 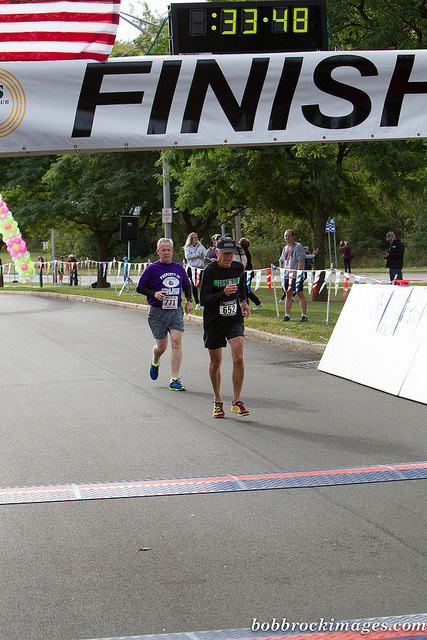 Dave Glass, who finished 2nd in 20:16, a half minute ahead of Jim May, was installed as the favorite. He was coming back from injury at Dedham in April but had run times this summer that suggested he was fully healed. 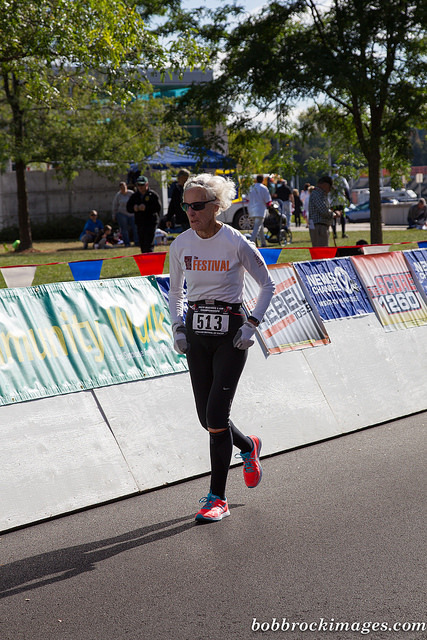 I had only finished 5th last year, but was only a few weeks out of physical therapy. This year I [Paul Carlin] had been on the podium in every championship I entered, from the 1 Mile to the Half Marathon. But Tony Gingello had only entered one of those races, the 10K at Dedham, and he beat me. 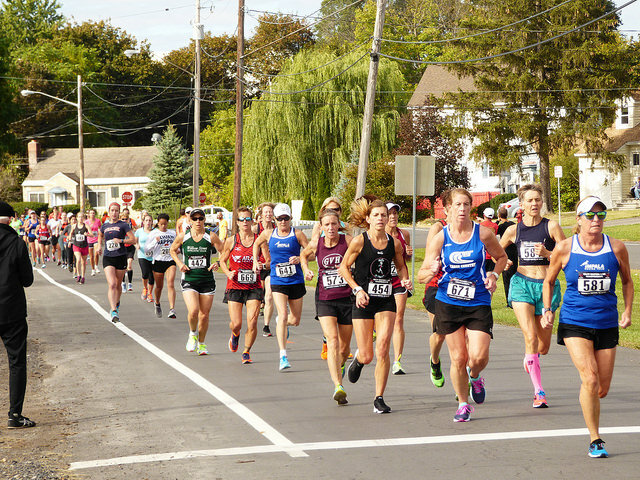 His times this summer suggested he was maybe slightly off his fitness, but it is hard to tell; Championship races often bring out the best in runners. I put Gingello down for 2nd but knew he would give Glass a real battle. I hoped I would too. May sustained a cross country skiing injury in late March but ran the 10K at Dedham anyway for his team, but he suffered. I reckoned that he had not fully recovered so put him below me on the prediction list. What about Harold Nolan, who beat me in the Road Mile championship a month earlier? Nolan is known primarily as a middle distance specialist but he did run a 5K in the summer about a minute and a half faster than last year so I thought he had a chance at running 21 flat. If so, he would be a formidable opponent. In the end, I relied on his reputation and put him in with May. I thought Jan Frisby might have finally gotten motivated and might have shown up fit enough to give us all a lesson. Unfortunately for him, a kidney stone popped into his life 6 days before the race. He did show up with the intent of jogging at leas if things were okay but after this warmup he realized that would not make sense. There's always next year, and in 2019 he'll enter a new age group--watch out 75 year old's, guess who's coming!. I did not think Peter Davis nor Keith Yeates would be able to break 22 minutes based on this year's results, so I thought others would be more of a threat for the podium. I was wrong on two counts. Gingello took it out fastest from the gun along with Nolan. May and I came next, closely followed by Glass. By the kilometer mark, Gingello was 20 yards ahead of me, but I had passed Nolan; Glass was about to pass me. When they reached the halfway mat, it was Gingello at 10:16, Glass 3 seconds back and me, 1 second behind Glass. Nine seconds later Nolan sped by with Davis on his heels, followed by May 10 seconds later, and then Yeates. Nothing much changed from there to the 2 mile mark but at that point, Glass was able to find another gear, gradually leaving me behind and starting to close the gap to Gingello. I tried to move with Glass but was unable to. Glass caught Gingello after they turned back onto Colvin Street and outkicked him to the line to win in 20:56 with Gingello 6 seconds back and me another 11 seconds back. Glass had successfully moved up from 2nd last year to 1st this year; Gingello had a silver medal to go with his gold medal from the 10K, and I had my 5th consecuive podium finish in 2017. Thirty seconds later Davis came across the line in 21:42, just off the podium, proving my forecast wrong on the two counts; he broke 23 minutes, running faster tan I had thought, and he was the closest contender for the podium. Next in line was Yeates who passed May and gained a 3 second gap by the finish line. May was pretty much spent, but happy that he had contributed to a team victory. With only 17 seconds between first and third, this was one of the most competitive races of the day. 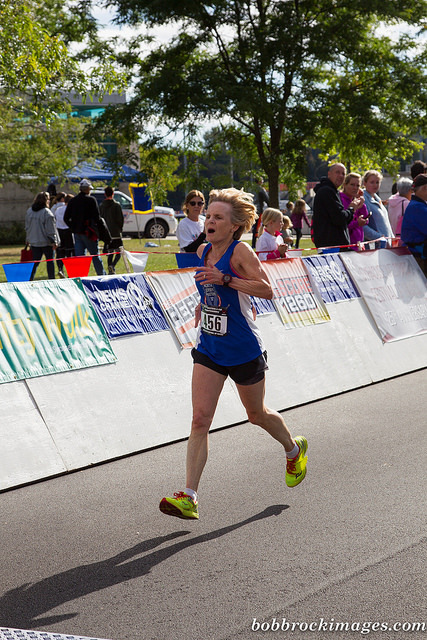 Dianne Anderson is the defending champion, but with the American record holder, Jan Holmquist entered, Anderson was happy to just focus on running her usual strong race to help the Impalas to a team medal. It was great to see a Champion like Holmquist running free and easy again. Fully recovered from injuries, her fitness is just a touch off what it was 2 years ago. Her winning time this year was 22:27. Her chip time, which is relevant for record attempts, was 22:26, only 12 seconds off her 70-74 Women's Only 5K American Record set two years ago here in the Festival of Races. Anderson collected her 2nd silver medal this year, to go with the two golds she has pocketed from Bend and Flint. 75-79. 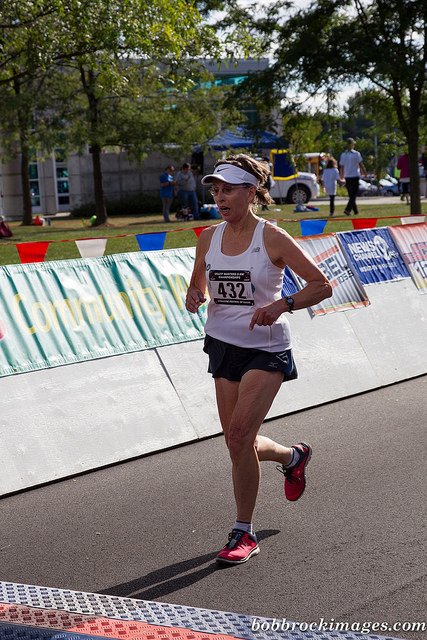 Madeline Bost, the champion from 2015 in 34:21, could not be present last year to defend her title. In her absence, Margie Stoll took the title in a fine time of 27:18. Stoll is not back and the rest of the competitors had times more in line with Bost's from 2015. 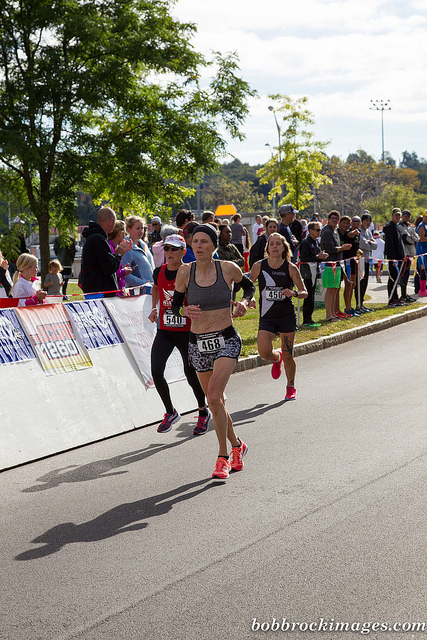 Fran Rowe took 2nd place in a photo finish with Estelle Hahn in 2016, both clocking 35:54, with Christa Maier over a minute behind them in 4th. Based on race times this summer, I opted for Rowe over Bost, with Hahn picked for 3rd. It seemed as if Maier's times were slower than those three. Bost and Maier were determined to prove me wrong. And did they ever! At the halfway point it was Maier leading the pack in 17:22, with Bost right on her heels one second back. Rowe was a half minute back in 3rd; that is not too much of a gap too overcome, but would she? Hahn was 1:22 back from Rowe, seemingly too far back to make a run for the win. Bost would have none of it as she continued her steady pace and Maier found she could not stay with her. Bost pulled away to win in 34:57, well over a minute and a half ahead of Maier. Rowe never got untracked and finished 3rd, another minute back from Maier. Based on his return from injury to run away with the division at the Road Mile Championship at the end of August, and run a 1:13:41 ten miler, I predicted Doug Goodhue would take this division with minutes to spare. I learned right before the race that Goodhe had tweaked his hamstring a week before during a training run but he hoped it would have no impact. Last year George Tooker took the title in 25:13 with Tony Fiori 2nd in 26:14. It seemed likely Goodhue would break 21:30 and might be a threat to break 21. In 2015, in an off year, Goodhue took the title in the 70-74 division in 20:07! Tooker ran 5K's this summer in the 25:17 to 26:31 range, with a 26:19 in the CVS Downtown 5K a few weeks before this race. It looked like he was ready to roll. Fiori ran 44:08 in the 8K in mid March which is age grade equivalent to a 26:56 so I figured Fiori was probably not ready to challenge Tooker. I could find no other results for Fiory on Athlinks. I ignored Charlie Patterson; I am used to thinking of him being in the 70-74 group and failed to notice that sometime over the summer he had aged up to the 75-79 division. That is important; Patterson ran 41:07 at the 8K in Virginia Beach and that is age-grade equivalent for a 74 year old of running a 25:06 5K. And I should also have noted that Patterson took the bronze medal in this division in the Road Mile at the end of August. Mea Culpa! I should have predicted that Patterson had a great shot at the podium. I was right about Goodhue but not as right as I expected. Goodhue went out with the top 70-74 year old's, as expected, crossing the halfway mat in 10:34, with 1:45 on his closest pursuers, Patterson and Fiory in 12:19 and 12:21. Tooker was 13 seconds back and thinking about closing that gap down. Shortly after the halfway point, Goodhue's hamstring flared up! He probably should have stopped but knew our Ann Arbor 70+ team was counting on him to be a close second to me. So he took one for the team and gamely finished at 22:45, winning the division by over 2 and a half minutes, but guaranteeing that his racing season was over. Back to rehab. But Goodhue has a plan, and we will see him back at the front of the 75-79 division in 2018. What of the other three? Fiory had a little more in his tank than Patterson and pulled away to claim 2nd in 25:26, seven seconds ahead of patterson. Tooker had the fastest 2nd 5K of the three, but it was not quite enough to catch Patterson who was still 3 seconds ahead at the finish line. This was another highly competitive race from 2nd through 4th with only 10 seconds separating the three competitors-wow! 80-84. Wade Stockman took the gold medal last year in 31:16 but was running slightly slower times this summer. In addition, Jim Askew had a win at the Road Mile Champioonship in Flint at the end of August and a 28:51 5K in the books in June. That was enough to make Askew the favorite. Based on reading the tea leaves of this year's performances I guessed that Steven Fuchs had a slight edge in fitness over Sam Graceffo but it would likely be close and depend n which of them has the better day. Askew left nothing to doubt, hitting the halfway mark in 13:20, with a nearly insurmountable lead of over 3 minutes. Stockman was taking care of business, hitting the halfway point in 16:26 with a 21 second lead on Graceffo. Fuchs was 11 seconds back, hoping to get a little closer. But things stayed the same. Askew came across the finish line in first at 28:08 with well over 5 minutes to spare. Stockman ran a solid 2nd half to take 2nd by nearly a minute and Graceffo held Fuchs at bay, claiming the bronze medal by 25 seconds. Second through 4th was not as close as it was in Men's 75-79 but it was close enough that if anyone faltered just a bit, they might well have lost their place on the podium. Libby James took the gold medal in this division last year in 25:14 while establishing a new American Record of 25:11 (chip time). Tami Graf took 2nd in 35:02 with a 4 minute margin back to Edna Hyer who took 4th. The 3rd place finisher, Anny Stockman, moved up to the 85-89 division. There was nothing in the races of Graf and Hyer this year that suggested a reversal of fortune. Hyer was favored for gold, with Hyer taking the silver medal. And that's the way it turned out. Each ran her own race, minded the pace and enjoyed a good run. Graf took 1st in 37:09. Four minutes later Hyer crossed the finish line in 2nd place. 85-89. As documented in an earlier post on records, Anny Stockman was the only entrant and was going for the American Record. She got the gold and the record, lowering the existing mark by over 3 minutes to 39:41 [chip]. David Rider beat two opponents to the line last year, taking gold in 35:32. It appeared he could easily run in the 36 to 37 range this year. He had no rivals until Sheldon Kall signed up towards the end of registration. Kall ran over ten minutes slower than Rider last year. Rider was faovred for gold with Kall taking the silver. No surprises here; Rider took 1st place in 36:44 with Kall over 12 minutes back in 2nd. 95-99. This was Roy Englert's show. He came to take down the American Record of 48:55. Crossing the halfway mat in 20:04, it was clear he would attain his goal. When he crossed the finish line with a chip time of 40:40 he had smashed, crushed, mangled and obliterated the previous record! His official winning gun time was 12 seconds slower. Like their younger Masters counterparts, there was competition on display, for the win, for the podium and even for bragging rights of 5th versus 6th! 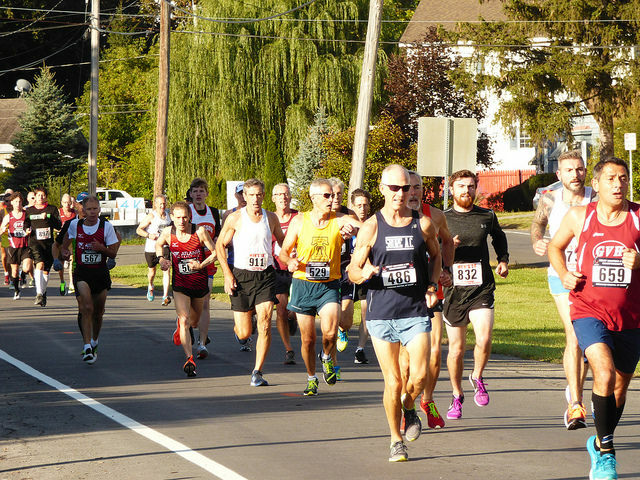 They did the Syracuse Festival of Races proud in the last show! Note: For now that is it. A team recap, if any, will have to wait until after the Preview of the Masters 5km Cross Country Championships is completed. Two weeks between Championships is tough, especially when both have well over 250 entrants.